Heat oven to 350°F. 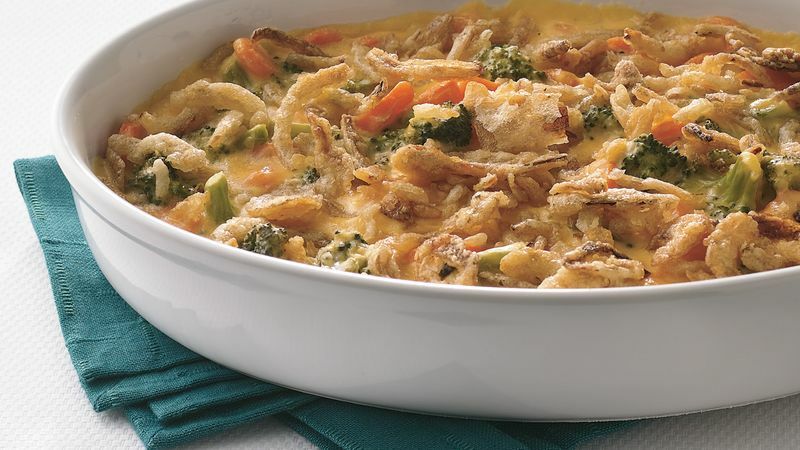 In ungreased 1-quart microwavable casserole, mix broccoli, carrots and 1/2 cup water. Cover with microwavable plastic wrap. Microwave on High 4 to 6 minutes, stirring every 2 minutes, until vegetables are crisp-tender; drain. Stir in sour cream, milk and cheese until well mixed. Sprinkle with onions. Bake uncovered 15 to 20 minutes or until bubbly and vegetables are tender. Other toppings can be used, such as fish-shaped crackers or croutons.